Winter smells good and I'm not talking about the food! 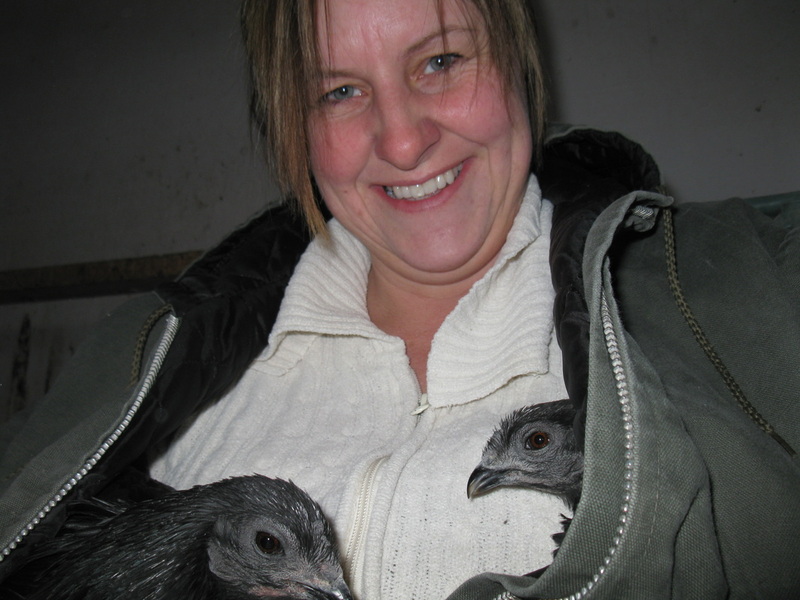 Black Sumatra rare breed hens love a cuddle when it's below freezing, who says chickens are stupid! Stepping out of the door this morning to -14 degrees Celcius (7 Fahrenheit), gently stung. Crisp cool air brushed my face and rushed my lungs. It invigorated me while the sunshine blinded me. It's the first real cold we've had so far this winter and a reminder of all the still, freezing cold days we've had the last 5 years here at Skeffling Lavender Farm. In the distance, from the barn, I heard my chorus of roosters. They know the sound of the house door slamming closed on its spring. The aroma of sweet maple woodsmoke greeted me after a second. Burning in our wood furnace, white smoke curled out of the central chimney. It smelled like summer campfires, cosy warmth and a stack of maple syrup drizzled pancakes. The barn smells better in winter, less ripe, and more of the animals than their manure. Chickens held close just have a clean dusty smell like a cat or dry timber. Nothing offensive or acrid, just comfortable. _The days above freezing smell of moist rot and decomposition as the microbes get conditions to thrive in. All necessary processes of course, but I love that the crisp cold is quiet and peaceful and even the microbes take a break. My Chickens are in their breeding pens! _I think these enormous Black Penedesencas are magnificent. The rooster is being gentlemanly and telling the girls where any treats are! They have already laid big pink eggs in their new digs, so no worries there! Here's more of my breeders below! 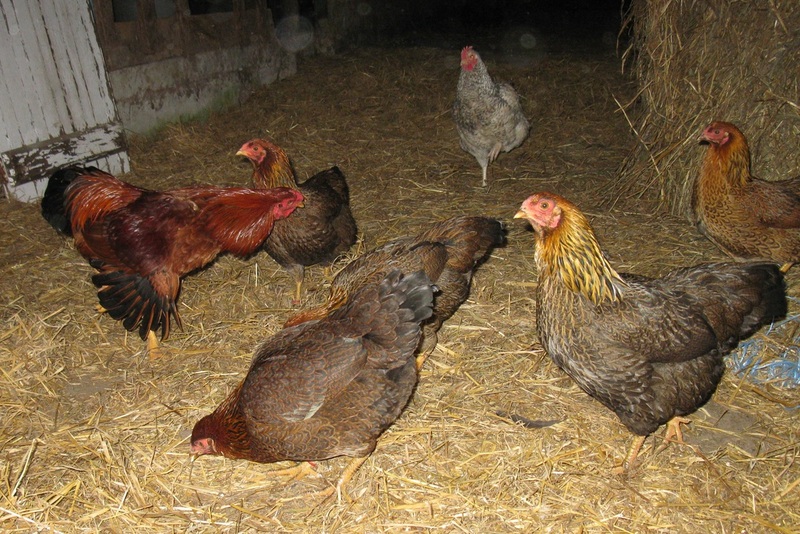 On Sunday night we rearranged about 70 heavy chickens into their breeding pens, what fun! So the 4-5 weeks clearance for pure bred eggs begins. That'll give me time to tidy up the hatching corner in the basement that is full of homemade wine that needs to be bottled. It's mead from our own honey, strawberry (bought pick your own strawbs, we only got a few of our own and put them in our jam) and our own rhubarb. The chickens are all getting on very well since the move. We never do a major move without being home next day or two to supervise. I have been checking on them a few times a day, especially the bachelor rooster pen and the pens with young pullets and old hens mixing. That is the Chanteclers and the Wheaten Ameraucana coops. A bit of pecking order establishment, but nothing serious. The girls wouldn't come out, so here the Lavender Ameraucana rooster alone in the run. Blinding sunshine on the fresh snow! And a chicken photography trick! I am looking at the most beautiful bright winter landscape this morning, for a few minutes, then another squall will roll in! Coming from England, I find the snow mesmerizing, fascinating and I love it! It is quiet as hubby is back at work, Christmas holidays over for another year. 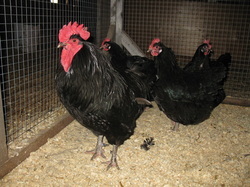 So I took some pictures of my Euskal Oiloak chickens (the basques) the other day. My young ones and they are so cute. The boys have some innate self-preservation cuddling gene and are handsome fellas! I learned a new trick for photographing poultry, and I used it to get the great pics below! Withhold their morning scratch til you are done taking pics and will you ever have their rapt attention, even the black penedesencas! Check it out. I can't wait to have better camera that takes closeup shots of nosy chickens. Most photographs taken of Euskal Oiloas are blurry closeups or of them pecking toes, laces, or snow off boots! 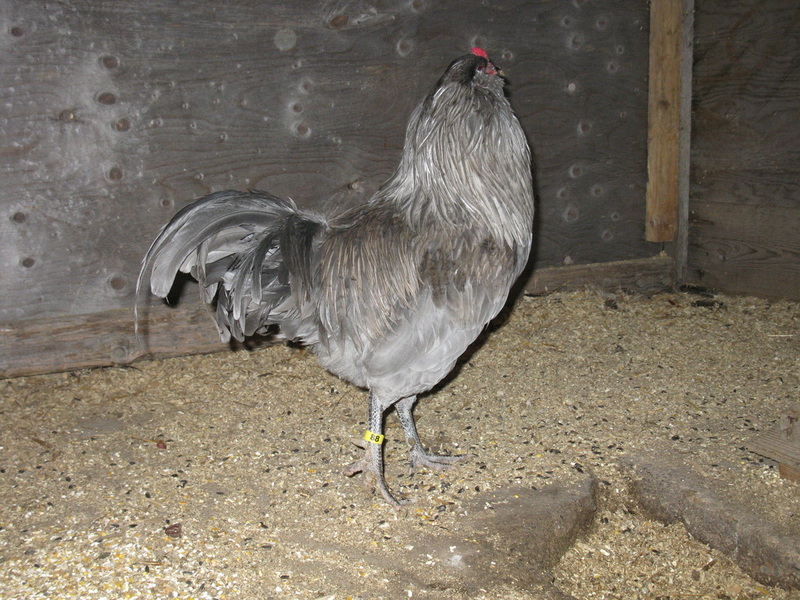 Speckled Jim my Euskal Oiloa rooster! See how big he is, the hen is a Lavender Orpington and is one of my biggest hens! He is a gentle sweetheart. Rare Black Sumatra hen "#5" wanting a cuddle. These calculating but endearing chickens are only affectionate in the winter when it is cold! Three woodgrained (Partridge) Chanteclers, cold hardy and awesome winter laying chickens! Looking for food! This is Sonny Jim, Specky's 18 week old Euskal Oiloa rooster son and he loves to cuddle. Definitely a keeper. 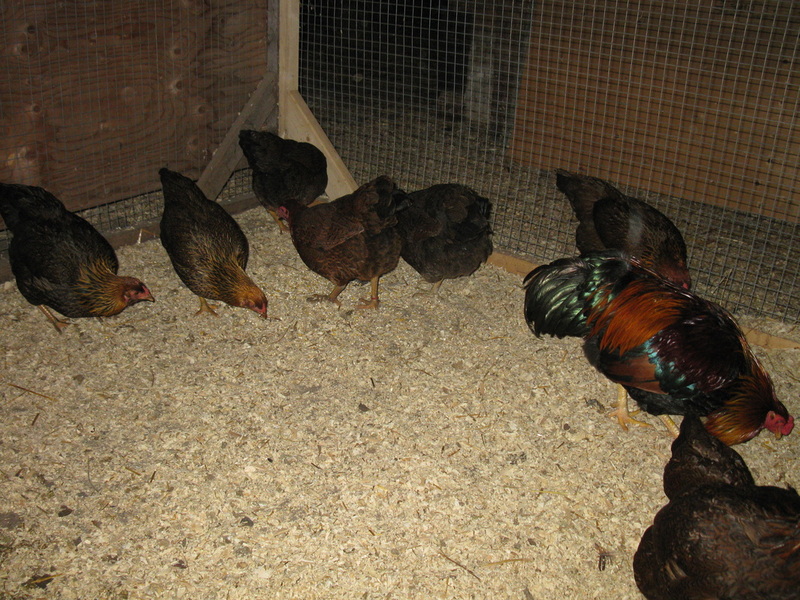 Partridge Chantecler rooster dancing for the girls. These young chickens are 22 weeks and the pullets are just laying. Welcome to our the new Skeffling Lavender Farm Website! Happy New Year! Welcome to our new Website! Happy New Year! It is melting and muddy slush here today after yet another thaw. I don't think we have had snow on the ground for more than 4 days at a time so far this winter. That's very unusual for Grey County and the Bruce Peninsula, but it will make for a shorter winter. The little pullets our chick-crazed broodies hatched this summer are just starting to lay even tinier pullet eggs. I think the Euskal oiloas are laying as well as the Chanteclers despite being 4 weeks younger and it being just past winter solstice. The eggs look too dark for the chanties. We even got a blue egg from Lawnmower girl, our miraculously surviving Lavender Ameraucana that got away with a shaved shoulder and wing in the summer. A daily dab of Watkins Petro-carbo fixed her up after a week. 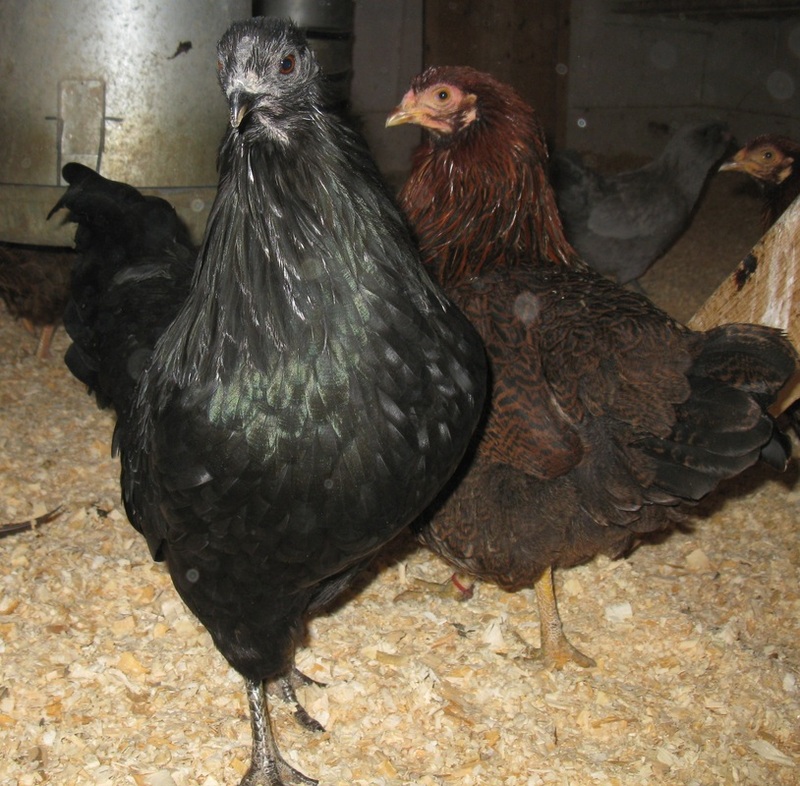 I am going to be hacthing and selling our pure bred chicken breeds eggs in Canada this year so check out our fertilized chicken hatching eggs page! Euskal Oiloak Basque hens, Partridge Chanteclers, Lavender Ameraucanas, Black Penedesencas, Lavender Orpingtons, Wheaten Ameraucanas and a few Black Sumatras. I took the pic below a few days ago from my computer window! It's my view when I am writing and I love it. I will be writing more in the new year. I am hoping to be able to take some time off doing dentistry at least this month. I'll be writing more chicken articles, and working on my Zazzle stores as I love the designing. The thing is, with both of those fun creative things is I have no idea where the time goes! So welcome, and enjoy and comment all you like! I'd love to hear your suggestions and questions and will answer them in my later blog posts. View to the West through our new Patio door!! Anyone who knows me knows I am a slightly eccentric Englishwoman who loves my long suffering hubby, my chickens , lavender, homesteading, being self sufficient and other stuff that is a little unusual.